Kandy is a must-see for all first-time Sri Lanka holiday makers, at least for those who intend to see a little bit more of the tropical island than just sandy beaches. Undoubtedly, the two major must-sees in Kandy are the Sacred Tooth Relic Temple sizuated at the picturesque Kandy Lake and the Royal Botanical Gardens in the university-suburb Peradeniya. But there is much more to see in Kandy and its immediate surroundings. Here is a list of 20 attractions we can recommend for your holidays in Kandy. Eager to visit all of them, you will need at least three days on a jam-packed schedule. But it’s much mire recommendable either to choose only few of them and study them in some more detail or to spend an entire week in Kandy and have some interesting additional daytrips, for example to Deanston in the Knuckles Range or to Hanguranketa and Mahiyangana. So let's get started, for heritage travellers here is our list of sightseeing highlights in and around Kandy, with short introductions for each attraction. The Dalada Maligawa, known as Tooth Temple in English, houses the most venerated Buddhist relic on the island. 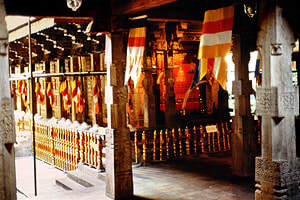 Particularly the Handun Kunama, the wooden hall safekeeping Buddha’s Tooth, marked by a golden roof in the very centre of the ensemble of edifices, is of exceptional beauty. It was constructed in the 17th century and a classical example of Kandyan architecture, whereas most of the surrounding structures are built of stone and date to the end of the 18th century. Even more impressive than the architecture of the Tooth Temple complex are the Puja ceremonies celebrated in front of the main shrine. When visiting Kandy, don’t miss to attend one of the three daily celebrations in the morning or evening. Though foreigners and non-Buddhists are welcome, it’s still an authentic Buddhist celebration and not at all a tourist spectacle - whereas Kandy dance shows are mainly of the letter category, to be honest with you. However, joining the traditional Tooth Relic Puja much frequented by locals will turn out to be a moving experience you will never forget. No true lover of nature will miss the Royal Botanical Gardens when visiting Kandy. They are among the world’s largest on a tropical island, only those of Bogor on Java can be compared with them in size and importance. Sri Lanka’s most famous Boanical Garden is situated in a river loop of the Mahaweli Ganga in Peradeniya, which is a suburb famous for its university. The gardens are well-kept and shadowy due to the trees, which represent an extraordinary variety of species from all over the world. The Botanical Garden’s orchid house is famous, too. Peradeniya attracted biologists already a century ago, for example the German evolutionist Ernst Haeckel. Even those Kandy visitors who are in a hurry will not miss to enjoy a photo stop at the slopes of the hills on the southern side of the lake. The beautiful views to the Kandy Lake and the charming city and the golden-roofed Tooth Temple.of the Tooth are the best way to understand why Kandy is called the “hill capital” and renowned for its natural beauty. Most busses stop at the car park of a winding street called Rajapihila Mawatha. However, just at this popular tourist car park there is a sports ground with fences in the foreground. That may be disturbing for those who like to take your pictures of Kandy’s most famous panoramic view. For photographers, there is better vantage point nearby, namely the Senani Restaurant. Another perfect place to take pictures is the Wales Garden. The Indian High Commission has also the classic Kandy view but can only be attended by those applying for a visa for India. The very best view, however, is exclusive for guests of the “Castle Hill”. 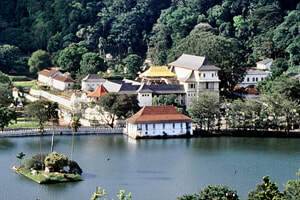 We don’t understand why most Kandy tourists do not visit the Malwatta monastery at the Kandy Lake, just opposite the Tooth Temple. The main ceremonial hall as well as the octogonal tower as well as the stylish monastic museum within the monastic compound are definitely worth a visit. Be aware, there are two distinct areas of the Malwatta monastery, the stupa and some more Kandyan style edifices are located within a separate compound which is situated about a hundred metres west of the entrance gate of the main compound. Lankatilaka is the largest and most beautiful of the Three Western Temples from the 14th century, about 12 km outside Kandy town. Lankatilaka is a calm and peaceful temple, perched on granite rock but easily to reach by road. 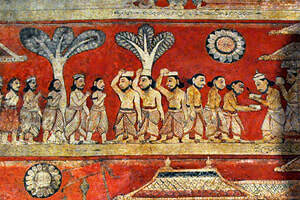 The lovely central shrine has tremendous murals in the Kandiyan style. 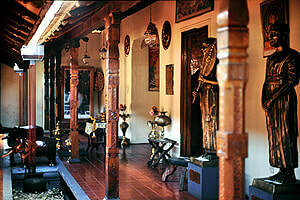 It’s the best example of a Kandyan-style inner room in the area of Kandy. In an additional cirumambulatory, there are statues of 5 Hindu deities. This Hindu part of the edifice can be entered from the western (opposite) side of the temple. Outside the temple compound, there's a good woodworker shop directly down the temple road. This new museum just behind the Tooth Temple is breaking the history of Buddhism up by region, with lots of information, photos and artefacts about the branches of this Asian world religion. The rooms are dedicated to various Buddhist tradtions, furnished and equipped by each of 18 Asian countries that are still mainly Buddhist or at least have been influenced by Buddhist culture. Indeed, with this concept representing various regions, the museum has become an exhibition retracing the history of Asia as well. As a traveller interested in religious tradition you shouldn’t miss the World Buddhism Museum, if you have a few hours time left during their stay in Kandy. Amidst the hurly-burly of Kandy downtown and its local markets is one of the “Four Devalayas” (“Hatara Devales”), they belong to the Sacred City of Kandy World Heritage Site. 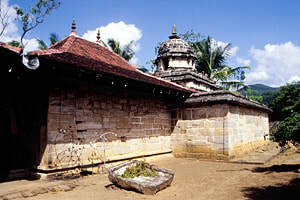 Devales are mainly Sinhalese temples dedicated to Hindu deities. Kataragama is the Sri Lankan version of the Indian warrior god Skanda, also known as Murugan particularly in Tamil-speaking regions of southern India and northern Sri Lanka. In contrast to the other three Hatare Devales of Kandy, the priests of the Kataragama shrine’s are Tamils and Brahmins, though most devotees visiting the temple are Buddhists. The main shrine is situated in a calm courtyard surrounded by other temple buildings, including one shrine for the Buddha. As mentioned, Kandy is charmingly surrounded by lushy green hills. The northern one just behind the Sacred Tooth Temple is known as Udawattakale, a typical tropical forest now giving a break from the buzz in Kandy city. Udawattakale is a small sanctuary inviting hikers for one or two hours walks on well-maintained jungle pathes, which still carry names from the colonial period, with some vantage points along the way. 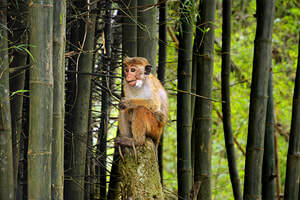 Apart from the trees and the central pond, Udawattakale’s main attractions are the groupes of macaques and the avifauna. This is to say, Udawattakale is Kandy’s paradise for birdwatchers. 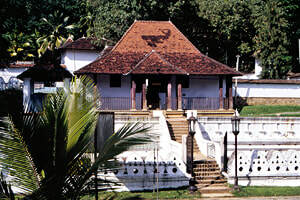 Embekke, one ot the three Western Temples from the Gampola period, is the woodcraft highlight near Kandy. The main shrine is dedicated to Kataragama, but adjoined to it, there with a secondary small Buddhist shrine, too. Embekke’s main attraction for lovers of art is the so-called Digge, the ceremonial “drummers hall” just in front of the main shrine. It’s the most famous specimen of traditional Kandyan architecture at all. But it’s even more than that for the art of Sri Lanka: The wooden pillars show the best examples of traditional Sinhalese wood carvings you can find anywhere on the island. Each carving is unique. Shops of woodcarvers can be found just outside the temple compound. Hantana is a village at the slopes of a hill just south-west of Kandy downtown, it’s a magnificent setting. Hantana can be found easily, as it is on the left side when you take the much-frequented road to Peradeniya. Hantana is the location of Kandy’s newly established Tea Museum, which is a good place to study the island’s tea history. Old machines in this former tea factory are still functional. In the Ceylon Tea Museum, you can learn more about how tea is grown and processed and also enjoy a cup of tea - or more than one to compare the tastes of different kinds of tea. The beautiful factury architecture is an attraction in itself. For buying tea, there are shops within the building, too. Degaldoruwa Rajamaha Viharaya is an inconspicuous typical small rock temple to the west of Kandy, on the opposite side of the Mahaweli river. 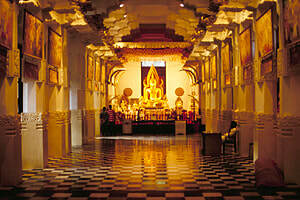 The amazing part of this historical temple from the 18th century is the decoration of the inner walls. 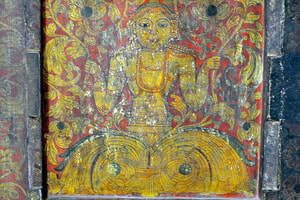 They are covered by the most elaborate Kandyan paintings you can find anywhere in the hillcountry. The frescos depict pivotal secenes of Buddhist iconography in the main cave, but even more interesting are the outer walls of that cave shrine, as the murals in the hall in front of it illustrate episodes of canonical Jataka stories in very much detail. The woodwork done at the door frames is remarkable, too. Degaldoruwa is a peaceful place, not at all crowded with tourists. If the cave temple is closed, ask a monk or assistant in the nearby monastery building for the key. Natha Devalaya is one of the four Devales (Hatara Devale) of the Sacred City of Kandy, the other three being the Vishnu, Pattini and Kataragama Devales. Of these four, Natha Devale is the one located next to the Tooth Temple. 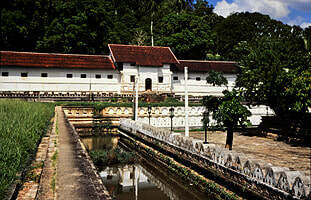 The main edifice of the Natha Devale is the oldest building in the valley of Kandy. It’s a simple version of the Gampola style stone architecture that can otherwise be studied at the contemporary temples of Lankatilaka and Gadaladeniya to the west of Peradeniya. Natha, the deity worshipped in this shrine which is older than the nearby Tooth Temple, is the guardian deity of Kandy. Natha, originally a local deity of the valley, has been identified with a Bodhisattva. 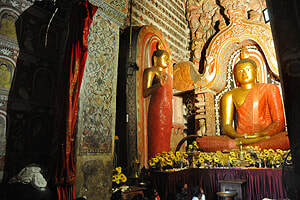 The Natha Devale is a mystical treasure place, too, as many Buddhists believe that the alms bowl of the Buddha, which can be considered to be the “Holy Grale of Asia”, is kept in this temple. Bahiravakanda is the name of the steep hill just west of Kandy downtown. In historical times, particularly in the centuries of the Kandy kingdom, it was believed to be the home of a demon called Bahirava. “Kanda” just means “hill”. Virgins are said to have been sacrificed to him annually. There is an ongoing discussion among historians, if human sacrifices really took place during the Kandyan period. 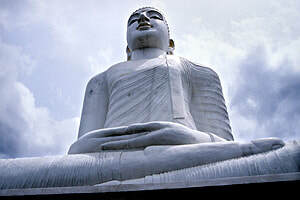 Today, a peaceful sitting Buddha is placed on top of the hill, overlooking the city of Kandy. The platforms offer great panoramic views to the the Kandy valley just below and the mountains of the northern highlands in the background. You have a choice: you can either hike or drive to the Bahiravakanda Buddha statue. 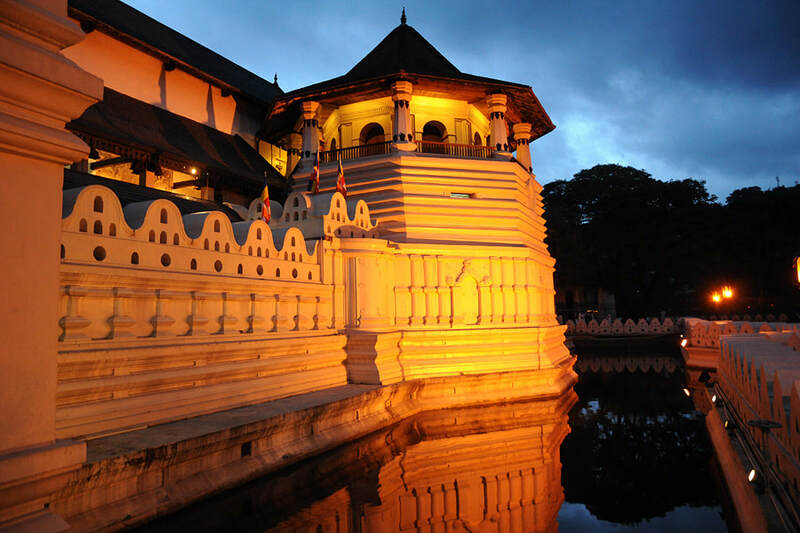 The Vishnu Devale next to the Royal Palace is one more of the above-mentioned Hatara Devale and thereby part of the Sacred City of Kandy and the UNESCO World Heritage Site of the same name. The Vishnu Devale is dedicated to the highest guardian god of Sri Lanka, Upulvan, who is identified with the Brahmanical deity Vishnu, venerated by Hindus and Buddhists alike. The interior of the structure is somwhat colourful. 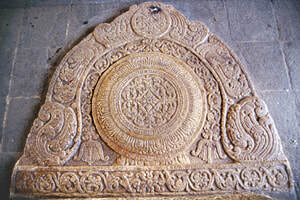 Don’t overlook when climbing the small access stairway: At it’s bottom lies the best surviving specimen of a Kandyan style moonstone, which is triangular in shape, in contrast to the semi-circular moonstones from the Anuradhapura and Polonnaruwa periods. Every year in July or August, the Vishnu Devale is the starting point of the world-famous Buddhist pageant called Kandy Perahera. The temple os open in the morning from around 5 am, when a first offering made is made here. The Gadaladeniya Temple is the northernmost and easiest to reach of the three so-called Western Temples which date from the 14th century, the Gampola period. It is located not far from the A1 main road to Colombo. Within the temple compound, there are at least two very different edifices of interest. 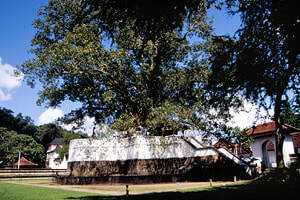 A small stupa named Vijayotpaya is sheltered by a wooden roof, that’s a quite unique feature now, but it was not uncommon to protect stupas by roofs in Sri Lanka. 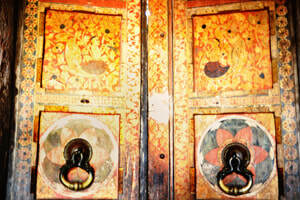 The main shrine of Gadaladeniya is famous for its doors, which carry the best-preserved and most exquisite paintings from the Middle Ages in Sri Lanka. 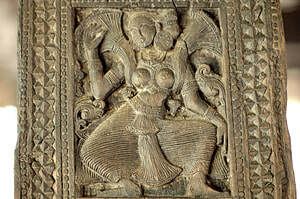 The flower maiden depicted is very popular and often copied in Sri Lankan art. It's a depiction of an Asian mythical being known as Kinnari. 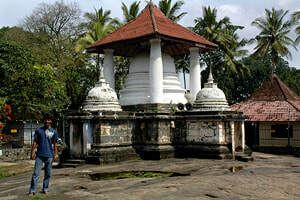 The restoration of the Gadaladeniya temple is part of the Cultural Triangle project sponsored by the UNESCO. The National Museum of Kandy is located behind the Tooth Relic Temple within a colonial style building that was part of the Harem in the former Royal Palace. 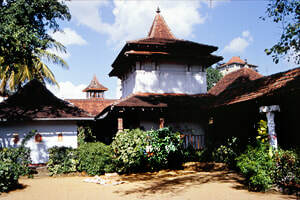 The museum, opened to the public in 1942, exhibits artifacts such as jewelry, tools and weapons from the Kandyan kingdom and the British Colonial era. Pattini Devalaya is one of three important shrines near the Tooth Relic complex, the fourth one being Kataragama Devale in Kandy downtown. Of these four so-called Hatara Devales, Hindu and Buddhist shrines dedicated to the four highest deities protecting the nation, Pattini Devale is the only one of a goddess. The Pattini Devale is much frequented by local devotees, particularly females praying for fertility and health. In front of the small shrine, the Bo-Tree of the Pattini Devale is the most impressive one in Kandy. The Garrison Cemetery, situated in close vicinity to the former Royal Palace, is the burial place of 19th century British soldiers and administrators who served in Kandy. Reading the inscriptions, you will be surprised that most of them died at a very young age, most often due to then unknown tropical diseases. A small adjoining museum in a former chapel provides a fact sheet for visitors. The staff maintaining the tombs can help you to find specific tombstones of interest. Kandy’s Garrison Cemetery is a peaceful and well maintained place. 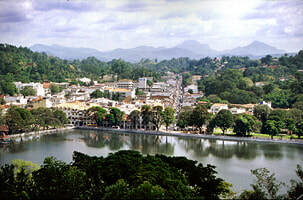 Ampitiya is a village off-the-beaten-track in the south-eastern outskirts of Kandy. There is a small Roman Catholic monastery called Monte Fano in this hilly area. You have to climb a long winding road uphill to reach this tranquil place. Monte Fano is the main monastery of the Sylvestro Benedictine Priory in Sri Lanka. It was founded in 1845. The monastery shelters a carbon copy of the famous “Shroud of Turin”. The Rajamaha Vihara of Galmaduwa, located to the east of Kandy behind the Mahaveli River and not far from the Degaldoruwa cave temple, is an incomplete sructure from the late Kandyan period (18th century). It is a stone-built temple of a quite strange design. A circumambulatory surrounds the central shrine, that’s not unusual. But the steep tiered roof, resembling a Tamil gopuram, is somewhat surprising at a Buddhist temple. The tower is a structure consisting of seven diminishing storeys. King Kirthi Sri Rajasinghe is said to have been engaged in completing this temple. But after he had heard of the discovery of a secret tunnel at Degaldoruwa, he stopped the work on Galmaduwa .Therefore, the unfinished building was not used as a temple during the Kandyan period.